Material of production certainly makes difference to the product performance. The metal pallets are demanded by different industrial and domestic sectors. 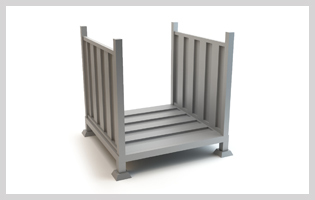 We provide complete customized range of metal pallets as per applications. We use various metal and also combination of materials to fulfill requirement of clients. With higher production set ups and advance manufacturing facilities, we provide suitable solution to meet all kind of client’s need. For the corrosion resistant application, we make use of alloyed grade material to fabricate the metal pallets.